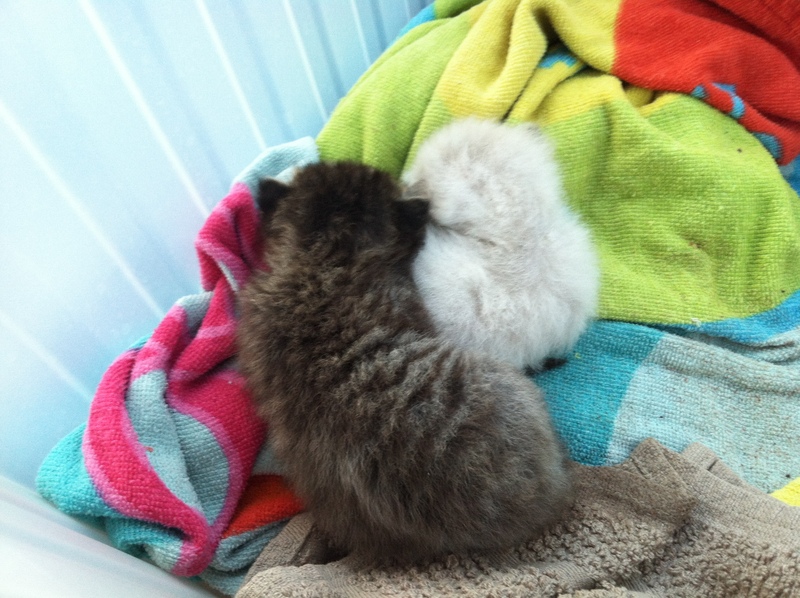 Now that I have made the grand announcement about my kittens, perhaps a little backstory. I believe this is the same strategy babies use to survive in the wild: beguile you with chubby, helpless cuteness, then rob you of all your sleep while covering themselves (and you) with everything that goes in or comes out their teeny-weeny digestive tracts. Just when you begin to give them dark sidelong glances, they snuggle into a little ball in your arms and fall asleep, and your insomnia-addled brain coos “Ohhh!” I have no empirical evidence to support how well this strategy works for babies, but it definitely worked for the kittens. 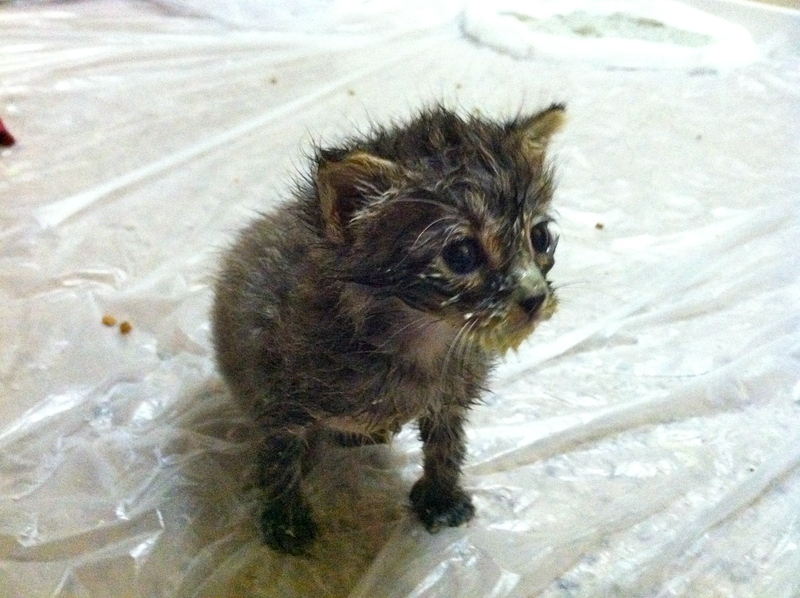 There were a few weeks entirely spent washing kitten formula out of kitten fur. That picture is is one of about a million that I took when kittens eating formula out of a dish, not a bottle, was the most exciting thing ever. Kittens that are old enough to eat from saucers are also old enough to sleep through the night. Less exciting was washing formula off the kittens, because their preferred method of eating was swimming through the saucer. And then crying when they were cold, wet, and sprawled across an empty saucer. Months later, the smell of still Dawn triggers memories of bathing kittens in the sink. 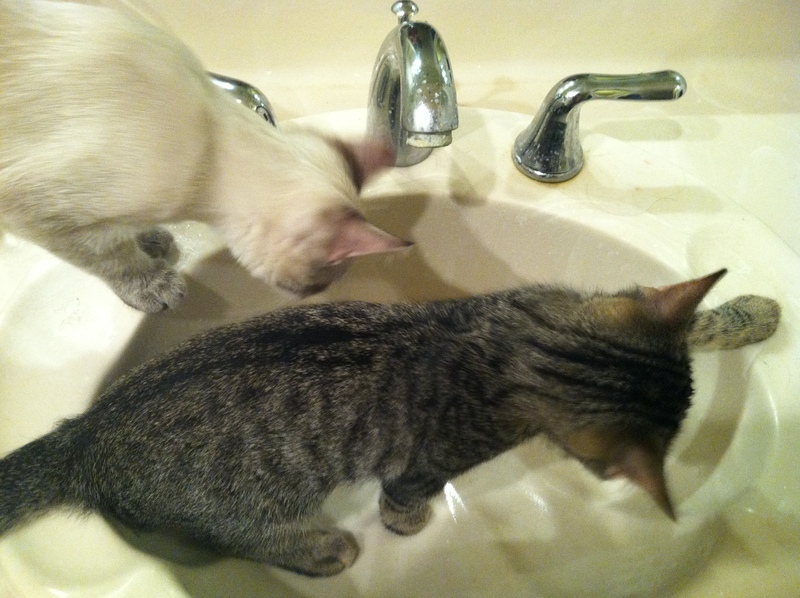 The kittens are obsessed with sinks and showers and places they can get wet. Perhaps as a result of spending the first two months of their lives either in a bath or drying after a bath, the kittens now love to play in water. Sinks and showers are great fun, but when one is a kitten, everything is a toy. Toys are EXCITING, because everything a kitten thinks is thought in caps, and PLAYTIME is attempting to eat or otherwise destroy THE BEST TOY EVER. Plush flamingo on the end of a stick? BEST TOY EVER. Binder clip? BEST TOY EVER. Melba? BEST TOY EVER. Your sleeping head? BEST TOY EVER. Finding names for little creatures whose cuteness was rivaled only by their capacity for destruction was a challenge. I was very tempted to go Austen, but decided that was too Crazy Knitting Librarian With Cats. The white kitten, who was very loud and chubby but not particularly coordinated quickly became Eloise. The tabby was voted a boy by a majority of vets and vet techs, and became Malthus. We then found out he was a she, but the name was stuck. Malthus the Girl Kitten is a hunter, and practices principles of population control on our society of fun fur mice. This picture represents how kittens spend 0.000001% of their time. After several months of new kitten madness, we are all settling in. 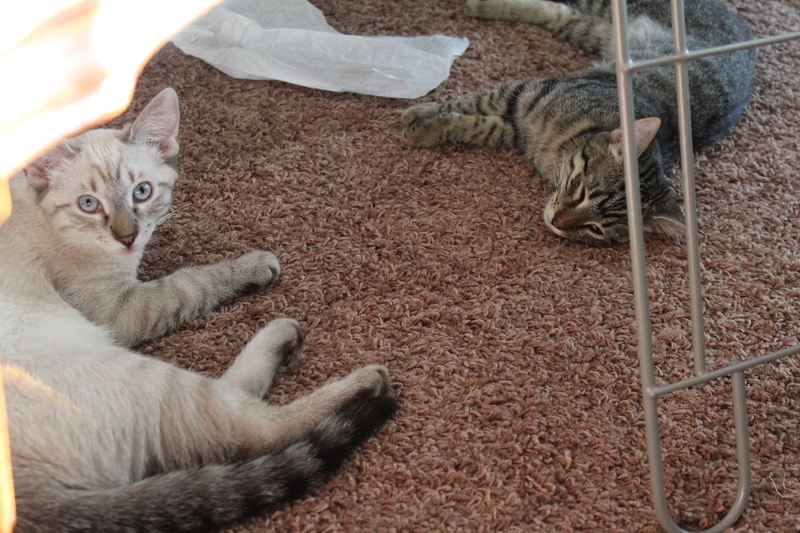 Shots and spaying are all taken care of, and they seem to be getting accustomed to the idea of SLEEP. I hope you all like kitten pictures: there are a lot more where these came from. I’m glad too 🙂 More pictures will definitely follow!